We are a group of parents who have set up the charity ARBAN UK* to help improve the lives of people living in the slums of Dhaka, Bangladesh. Our desire to help is borne out of recognition that, as parents in the UK, we have much to be grateful for. We have running water, flush toilets, waste collection and free education. If a child is sick we can see a doctor, call an ambulance or stay in a clean, high-tech hospital without cost. In the slums of Dhaka, 4 million people live in shacks with no running water or sanitation. During monsoon season their makeshift homes flood with sewage. Many do not eat every day because they can’t afford food. If their children become ill, they are likely to die as they cannot afford the costs of healthcare – the travel, consultation and medication. We are supporting the work of the Bangladeshi non-governmental organisation, The Association for Realisation of Basic Needs, ARBAN. ARBAN have been working for 27 years to help improve conditions for what they call the “forgotten people” of Bangladesh. We are raising money for a project to improve maternal and infant health in Jheelpur Slum. 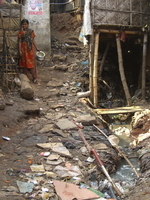 £30,000 will provide a clinic in the slum where a full-time doctor will be based, removing the barrier of travel costs. Families will be given a health card and will be able to attend a health clinic for free. They will be given nutritional food, some for free, some subsidised. Using home visits and group sessions, a Health and Hygiene Promotion Officer will share advice on how families can best care for themselves – simple awareness of how to prevent basic diseases can make a considerable difference. Dr Kamal, head of ARBAN, believes that over time this project will become sustainable as families will be encouraged to make small contributions to the cost of medication. In February 2010, Saffia Farr visited Jheelpur Slum with Mohammed Shah of ARBAN. You can read about her experiences here. We hope that, like us, you are moved to help these families in Bangladesh. A small amount of money will make a big difference. Help us raise money – join Run for the Slum. Thank you for taking the time to read about our project.